When a pedestrian is hit by a car, it is the pedestrian who is usually the one left with debilitating, catastrophic bodily injuries. 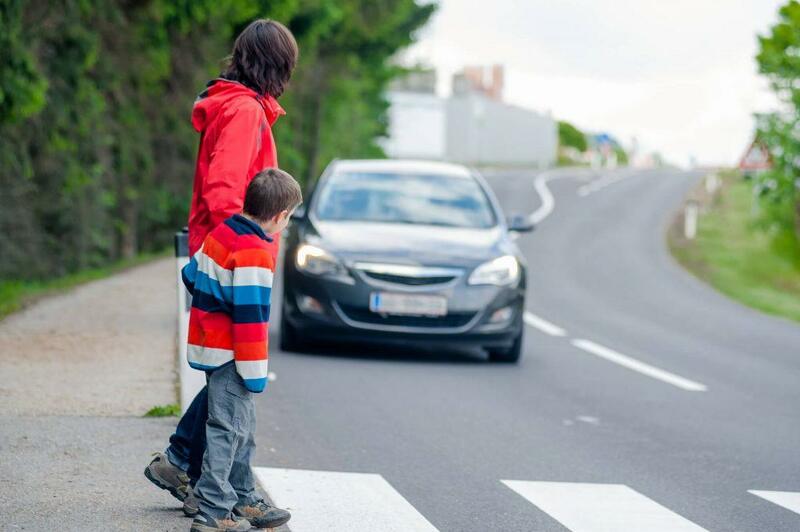 Pedestrian accidents can occur in an array of circumstances including when you are crossing the street, walking in a parking lot, walking across a driveway, or even simply standing on the sidewalk waiting for a friend or public transportation. The injuries suffered can be life-altering such as a traumatic brain injury, multiple bone fractures, spinal cord damage resulting in paralysis, and/or lost limbs. If you were hit by a vehicle at a crosswalk or any other area, the first step you need to take is to seek immediate medical attention. You need to see a doctor, even if you think the collision was “not that bad.” Your injuries may be less obvious such as a concussion or internal bleeding. These injuries require medical care right away. You also need to be able to document your medical care in order to substantiate a pedestrian accident personal injury claim. Regardless of how serious the collision was between you and the vehicle, it is important that you file a report with the police as soon as you can. If you are physically able, call the police and request immediate assistance. You should also get the car insurance information, name, vehicle model, driver’s license number, and phone number of the individual who hit you. This should also be done with any witnesses who saw the collision. Third party eyewitness testimony is tremendously helpful when negotiating an appropriate settlement with the insurance company and for convincing a jury to award you damages, if a trial is necessary. Be sure to keep track of the events that occurred after the collision. This includes your visits to doctors and other medical professionals, the opportunities and events you were forced to miss due to your injuries, the amount of wages you lost because you had to take time off work for rehabilitation and other issues related to the accident. These documents will serve to substantiate your personal injury claim. After seeking medical care, contact an experienced South Sacramento pedestrian accident lawyer to discuss the legal options and remedies that may be available to you. Most, if not all, pedestrian accident lawyers offer free, completely confidential initial consultations. During the consultation, you will get the opportunity to tell the lawyer exactly what happened. The lawyer will then review the documents you have available to assess the merits of your claim. If it makes sense to move forward, you can enter into an agreement to hire the attorney on a contingency fee basis. This means you do not pay the lawyer anything unless and until they obtain a financial recovery on your behalf. Reason No. 1 – Guidance from someone with extensive knowledge and experience in the personal injury claims process. Hiring a South Sacramento pedestrian accident lawyer means you will have the sound legal counsel of someone who has seen the tricks of insurance adjusters and knows how to present a case to a jury, if needed. A good attorney is going to help you navigate through the complex aspects of the injury claims process and pre-trial discovery phase so you can focus on getting well! Insurance adjusters get into contact with the accident victim right way. They do this so they can begin the process of convincing you to accept a low-ball settlement before you have had a chance to sit down with your personal injury attorney. They want to get you to give a recorded statement so they can use it against you later on if a claim is filed. Always remember, an insurance adjuster is not your friend and they are not on your side. Having a South Sacramento pedestrian accident attorney on your side will allow you to turn the negotiating process over to the attorney so you can focus on your rehabilitation. In some accidents involving a pedestrian and an automobile, the driver may try to argue that the pedestrian was at-fault, not them. You will want to have a good personal injury lawyer on your side if liability is in fact contested. This is because the insurance company for the driver will likely deny your claim if liability is unclear. A lawyer can help ensure your accident is properly examined and investigated to assess the likelihood of who was really responsible for causing the collision. Even if you were partially at-fault for causing the South Sacramento pedestrian accident, you can still pursue a personal injury claim since California adheres to a comparative negligence standard for civil claims. If negotiations fall through between you and the insurance company, a lawsuit will need to be filed. This means you will need to be ready to conduct pre-trial discovery, including depositions, and plan for a trial in front of a jury. Having a lawyer on your side means you have someone who is ready and able to present a compelling case to the jury so they award you a substantial verdict. Under California law, there is a statute of limitations governing the amount of time within which an injured pedestrian can file a lawsuit against the driver of the vehicle that hit them. In South Sacramento, you have two years in which to file a lawsuit seeking recovery of economic and non-economic damages stemming from the collision. However, the statute of limitations may be even shorter if the vehicle that hit you was a city or state vehicle. Under California law, a personal injury lawsuit filed against a government-owned entity requires notice be sent to the entity within six months of the collision. As you can see, taking immediate action to protect your legal rights is strongly recommended. Pedestrian accidents routinely involve extensive, catastrophic injuries that result in lost wages, huge medical bills and other damages. That is why you need an experienced South Sacramento pedestrian accident lawyer on your side. I’m Ed Smith, a South Sacramento Pedestrian Accident Lawyer. If you or someone close to you has been struck by a motor vehicle or passed away after being hit by one, please reach out to me for compassionate, free and friendly advice today. I can be reached at 916.921.6400. When you call me, we will go over the specifics of your case and determine how best to proceed with an injury or wrongful death claim. It is free to call and talk to me. Just ask for Ed. I take cases on a contingency fee basis. This means you pay nothing up front. No retainer fee. I get paid at the successful conclusion of your case. If you don’t win, I don’t get paid. My clients have extensively reviewed my services on these sites: Yelp, Google and Avvo. See some of my Verdicts and Settlements. I am really honored to be a Million Dollar Forum member in the state of California. The forum is for top-ranking trial lawyers with verdicts and settlements in excess of $1 Million.